It is important to be prepared for severe weather like snow storms. No matter where you live, you may experience severe weather at some point. Preparation is important but you also need to have a plan for what you are going to do during and after the storm can help your family survive severe weather. Hurricane season is June 1 to November 30. Since hurricanes take time to develop, you typically get three-five days' warning before the storm lands in your area. This gives you time to make sure that your preparations are complete. Bring in loose toys and furniture. Board up windows and doors with plywood. Turn down freezer and refrigerator settings so that food will stay cold for longer if power goes out. Do not use tap water for eating or drinking until it has been cleared by city officials. Until roads have been cleared, stay off the roads unless absolutely necessary. Use flashlights instead of candles for light. Check the food in the refrigerator and throw it out if there is any suspicion about spoiling. Listen to the radio or watch TV to keep track of the local weather forecast. Additional information about hurricane safety can be found at the Red Cross web site. Unfortunately tornadoes occur relatively swiftly compared to hurricanes so you do not have as much time to prepare. However, there are some tasks that can increase your chances of survival during and after a tornado. Select an interior room -- preferably without windows -- on the lowest level of your home as a safe room. This is where everyone will gather when there is a tornado warning. Trim damaged and dead limbs from trees in your yard. Secure furniture or trash cans that can become projectiles during a tornado. Know how your community warns citizens about tornadoes so that you can take action if you hear a warning. Know the warning signs of an impending storm -- like dark clouds, hail, funnel clouds, and a loud roaring noise like a train. Move to a shelter, basement, or interior room during the tornado. Mobile homes are not safe during these storms. If you are outside, you need to get to a safe place. If that is not possible, you can sit in your car with your head positioned below the windows. You should avoid returning home until directed to do so by safety officials. Avoid damaged buildings and downed power lines. Alert the power company about damaged lines. If you hear a hissing or blowing noise or smell gas, evacuate the building and contact the fire department. Winter storms,snow, freezing rain, and hail, can be short or can last for several days. Roads may be shut down and power may be interrupted. After one of these storms, you and your family may be stranded in the house without heat for a few days. Make sure that your car is prepared for winter weather and keep your gas tank filled. Maintain your heating system and insulate your home. Keep water running - at low flow - to keep pipes from freezing. For winter storms, you should have at least a three day supply of water and nonperishable food for each person in your household. You also need flashlights with extra batteries, a first aid kit, cell phones with chargers, a battery-powered radio, and extra cash. A supply of extra prescription medication and extra hygiene items may be needed if you end up stranded in your home. 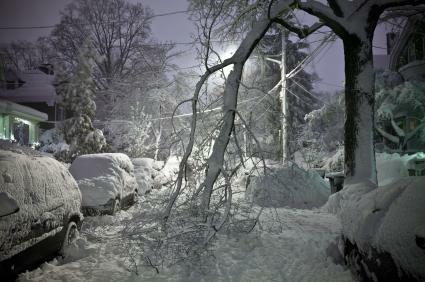 If your power goes off, you may be without heat or power. It is important not to use a generator, grill, gas stove, or other device inside your home. These appliances emit carbon monoxide which can lead to carbon monoxide poisoning. When there is no power, people often use them inside to make meals and to provide heat. It is a very bad idea. Stay inside if possible but if you can't, you should wear multiple layers to protect from frostbite and exposure. Bring your animals inside if possible. Avoid driving if there is sleet, freezing rain, snow, or fog. Take a minute and think about your health and the necessity of the task before you perform any strenuous tasks outside. If your home loses power or heat, you may need to go to a shelter if the cold is life-threatening. Before any type of storm, you need to make sure that you have copies of your important personal and legal papers in a safe place. Contact phone numbers and addresses should also be included with these papers. After any type of bad weather, you should always take pictures of any damage to your home and property to submit to your insurance company. Local fire or police departments may offer courses in disaster preparedness like the Community Emergency Response Teams or CERT program. These programs teach you about disasters that may occur in your area so that you can be prepared to potect yourself, your family, and your community. You can also take classes at the American Red Cross in your area or online at the the FEMA Emergency Management Institute. The Salvation Army offers courses in disaster preparedness if you are interested in learning about larger-scale help efforts for your community after an emergency. You can check online for other programs in your neighborhood. While these storms can be scary, preparation for any type of severe weather allows you to protect your loved ones and keep them secure.